We’d love your help. Let us know what’s wrong with this preview of This Side of Sad by Karen Smythe. Part mystery, part elegy, This Side of Sad begins with an ending: the violent enigma of a man's death. Was it an accident, or did James commit suicide? In the shattering aftermath, his widow, Maslen, questions her own capacity for love and undertakes a painful self-inquiry, examining the history of her heart and tracing the fault lines of her own fragile identity. What eme Part mystery, part elegy, This Side of Sad begins with an ending: the violent enigma of a man's death. Was it an accident, or did James commit suicide? In the shattering aftermath, his widow, Maslen, questions her own capacity for love and undertakes a painful self-inquiry, examining the history of her heart and tracing the fault lines of her own fragile identity. What emerges is a mesmerizing tour of a woman's complex past, rendered in the associative logic of memory and desire. To ask other readers questions about This Side of Sad, please sign up. This Side of Sad is a fascinating book and one I enjoyed reading as time went on. 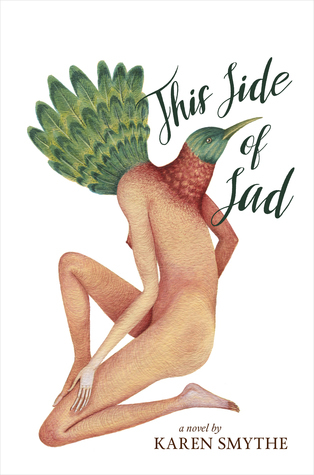 Not exactly a diary, journal or a memoir, This Side of Sad is a collection of "scrambled episodes" that map out one woman's travels down the road of past relationships and how they form who she is today. Loved this first novel by Karen Smythe. It was recommended to me by a person working in an independent bookstore in Waterloo, Ontario. What appealed to me was supporting an emerging woman author from nearby Guelph, Ontario. This is a book I couldn't put down. It reads like having a conversation with a close friend, a reflective conversation about her life, mainly through key relationships with 4 men; Rob, Josh, Ted and James. Mostly focused on Josh, Ted and James. What she learns about herself th Loved this first novel by Karen Smythe. It was recommended to me by a person working in an independent bookstore in Waterloo, Ontario. What appealed to me was supporting an emerging woman author from nearby Guelph, Ontario. This is a book I couldn't put down. It reads like having a conversation with a close friend, a reflective conversation about her life, mainly through key relationships with 4 men; Rob, Josh, Ted and James. Mostly focused on Josh, Ted and James. What she learns about herself through her relationships and friendships with each. When they overlap. Her interest in following their paths after losing touch and what she discovers about them and herself. I like her name - Maslen. The book was first described to me as being all over the place in terms of time - not linear at all. That appealed to me. And so when I finished reading the Foreward, I loved the diagram of two heads joined by a spirally chain of words that made me turn the book around and around to read that text. A great start for how the novel unfolds! The telling came across as scattered while organized as any conversation unfolds with a friend - in the listening you open to the threads and where and how they connect as well as what happens in your mind, your own reflections and memories of relationships and friendships. Maslen goes through breast cancer and double mastectomy in the novel. I love the attention to her response to this challenge and the decisions she makes. I loved the way the novel is organized into 5 movements: Begin; Beguiled; Beloved; Bereft; and Blessed. All starting with B. I can related to all and in that same order! The novel is very engaging and feels very authentic. Close to the truth of who we are and how we function. A man at my local bookstore recommended this book to me as one of his favourite books of the year. I’m glad he did, as I don’t know if I would have found the book otherwise. Personal, wise and endearing, Mazlin and her story will stay with me for a long time. Didn’t even finish reading the book. Not my cup of tea. Karen Smythe is the author of a short-story collection, Stubborn Bones, and Figuring Grief, a groundbreaking analysis of the depiction of mourning in fiction by Mavis Gallant, Alice Munro, Virginia Woolf, Edna O'Brien, and others. Her stories have also appeared in Grain, the Fiddlehead, the Antigonish Review, and the Gaspereau Review. She lives in Guelph, Ontario.